Let's impeach Obama and pre-impeach Clinton. Yesterday, the Benghazi Accountability Coalition, a collection of a dozen conservative groups, chaired by conservative lawyer and author Andrew McCarthy, held a symposium at the Heritage Foundation. Today, the Obama administration announced it has captured Ahmed Abu Khattala, an alleged ringleader in the attack. Accountability! From one scandal to another. The Obama administration is now shifting focus to Benghazi - which President Obama said was “phony” - announcing that one of the ringleaders of the attack, Ahmed Abu Khattala, had been captured on Sunday in Libya by U.S. forces. 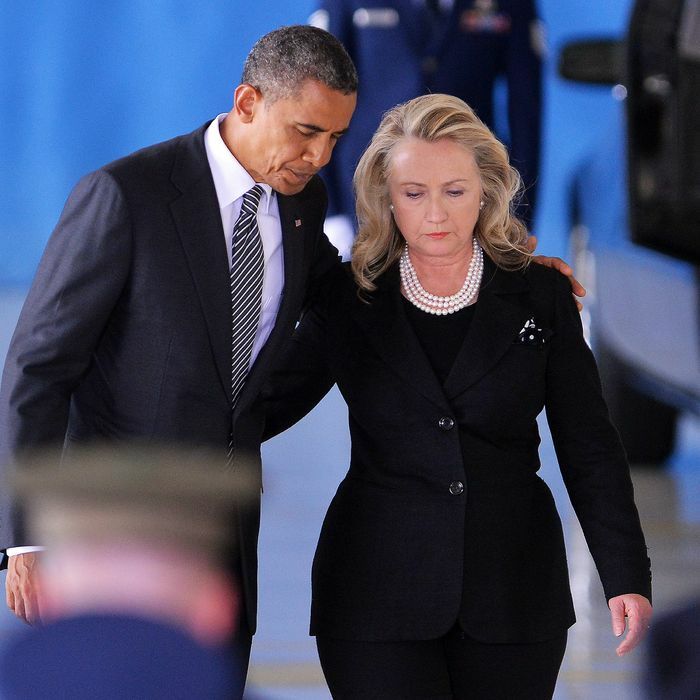 To clarify, Obama never called the attack on Benghazi phony. He called the conservative conspiracy theories surrounding the attack phony. But never mind. McCarthy has a new book out: Faithless Execution: Building the Political Case for Obama’s Impeachment. Full disclosure: I have not read the book and hopefully never will. I did read a lengthy interview he gave to Kathryn Jean Lopez, a colleague at National Review, to which McCarthy contributes frequent angry rants. You need to read the whole interview in its entirety to capture the peculiar combination of mock-judiciousness and spittle-flecked paranoia McCarthy brings to the subject, or subjects. LOPEZ: Could you make a legal case for impeachment on just one of the many Constitutional problems you raise in the book? MCCARTHY: Sure. A strong legal case can be made for all seven of the articles I propose (each of which has several subparts). Several subparts. Each. And it’s not like Voldemort, where you have to destroy all seven horcruxes in order to kill him. Just one impeachable offense is enough. McCarthy adds that the Bergdahl prisoner swap, which occurred after his book came out, could be added to the list within one of the existing categories. No wonder Benghazi obsessives aren’t mollified. Khattala, reports the New York Times, “told both fellow Islamist fighters and others that the attack in Benghazi was retaliation for the same insulting video, according to people who heard him.” He’s part of the cover-up.